What does a Republican senator do when threatened on his right by not one but three Tea Party conservatives who say he's just a girlie man in need of a good thrashing? Why, he makes political hay out of attacking women's rights, natch! 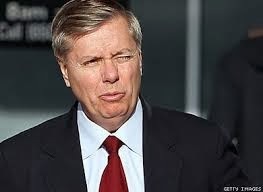 So South Carolina Senator Lindsey Graham chose Fox News this morning to announce that he'll be pushing to make abortion illegal in this country after 20 weeks. There's no chance whatever that such a law will ever pass the Senate, and no chance whatever that President Obama would ever sign such a law. But that doesn't matter. All that matters is the show of conservative macho. So are we to believe that the voters of South Carolina are dumber than a box of doorknobs to buy Senator Graham's display of a cosmetically enhanced hairy chest? And what kind of a human being decides to beat up on any class of citizens, especially ones he considers weaker and hence available tools for his political grandstanding, just for the sake of a pathetic job? Never underestimate the gullibility and stupidity of South Carolinians. They started a Civil War, you know. Got their butts beat by the end of tha affair, but they never learn. Wtomen are not slaves, but the principle is the same, no redneck can feel good about himself unless he is looking down on some class of people: blacks, women, immigrants, Muslims, you name it.